His Holiness the Je Khenpo appointed a Lam Neten for Dagana Rabdey this morning. His Holiness also appointed Khenpos of Phuentshogling Goenzin Dratshang and Lha Dzong Sherubcholing Shedra in Gelegphu. The 48-year-old Lam Tshering is from Toedwang Gewog in Punakha. He joined the Pungthim Dratshang at the age of 11. The new Dagana Lam Neten has a master’s degree from Tango University of Buddhist Studies. Prior to the present appointment, he served in various posts in Central Monastic Body. He has also completed three years retreat (Lho-Sum-Cho-Sum). Khenpo Tshering from Paro will now serve in Lha Dzong Sherubcholing Shedra in Gelegphu. 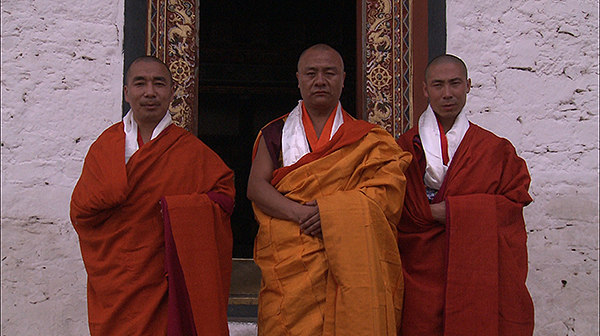 He began his monastic life at the age of 10 in Dechen Phodrang Monastic School in Thimphu. He has a master’s degree from Tango University of Buddhist Studies. Before assuming the present designation, Khenpo Tshering served as a senior lecturer in Dorden Tashi Thang Buddhist University in the capital. The 40-year-old Khenpo Ngawang Jigme Tenzin from Punakha is now the Khenpo of Phuentshogling Goenzin Dratshang in Chhukha. He also has a masters degree from the Tango University of Buddhist Studies. His started his monastic education at eight. Before his current appointment, Khenpo served as a lecturer in Tango and Dorden Tashi Thang University of Buddhist Studies since 2011.